WASHINGTON, D.C., March 20, 2018 — Daily weather patterns, brain activity on an EEG (electroencephalogram) and heartbeats on an EKG (electrocardiogram) each generate lines of complex data. To analyze this data, perhaps to predict a storm, seizure or heart attack, researchers must first divide up this continuous data into discrete pieces — a task that is difficult to perform simply and accurately. Researchers from the Universidad de la República in Uruguay and the University of Aberdeen in Scotland have devised a new method to transform data from complex systems, reducing the amount of important information lost, while still using less computing power than existing methods. They describe this new method, which enables the estimation of probabilities in dynamical systems, in the current issue of Chaos, from AIP Publishing. Historically, researchers have divided up data from a dynamical system through Markov partitions — a function that describes a point in space in relation to time, such as a model that describes the swing of a pendulum. But Markov partitions are often impractical in real scenarios. In the new approach, researchers use movable marginal partitions to search the space of observed variables that make up time series data for an approximate Markov partition. "Markov partitioning is transforming a continuous trajectory of a dynamical system stored in variables of high resolution into something discrete that can be stored in a finite set of variables with finite resolution, for instance, an alphabet," said Nicolás Rubido of the Universidad de la República. A commonly used approximate method already exists that slices up the data from a time series into the bins of a histogram, but it uses bins that are all the same size. In this new study, the researcher set the bin boundaries in a way that reduces unpredictability in each bin. The new process transforms bins into easy-to-handle symbolic sequences that contain most of the relevant information from the system. Rubido likens the process to compressing a digital photo to a lower resolution, ensuring you can still make out all the objects in the image. The new method can be useful in analyzing any kind of time series, such as predicting a power outage by accounting for power plant production, the fluctuating input of renewable energy sources and the changing demands of consumers. 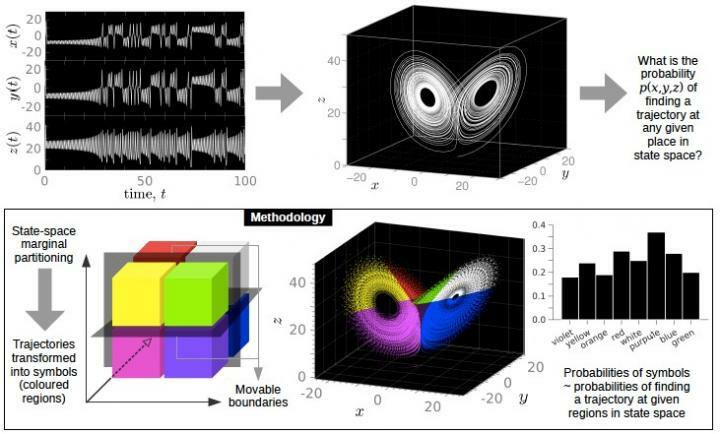 Rubido pointed out that this new approach offers no advantage over some of the existing methods for very simple cases, but said it could be especially useful for analyzing high-dimension dynamical systems, which quickly overwhelm existing computing power. "The higher the complexity, the more applicable and suitable the method will be," Rubido said. Next, Rubido and his team will work to optimize the method. Currently, researchers use "brute force" to set the boundaries of each bin, but they could try moving the boundaries back and forth in a controlled way to ensure that they're getting the most information possible in each variable. Once their method is optimized, the researchers plan to tackle more complex systems that have eluded analysis. The article, "Entropy-based generating Markov partitions for complex systems," is authored by Nicolás Rubido, Celso Grebogi and Murilo Baptista. The article appeared in Chaos March 20, 2018 (DOI: 10.1063/1.5002097) and can be accessed at http://aip.scitation.org/doi/full/10.1063/1.5002097.